Pennsylvania is home to the second largest land-based casino industry in the United States, trailing only Nevada’s. 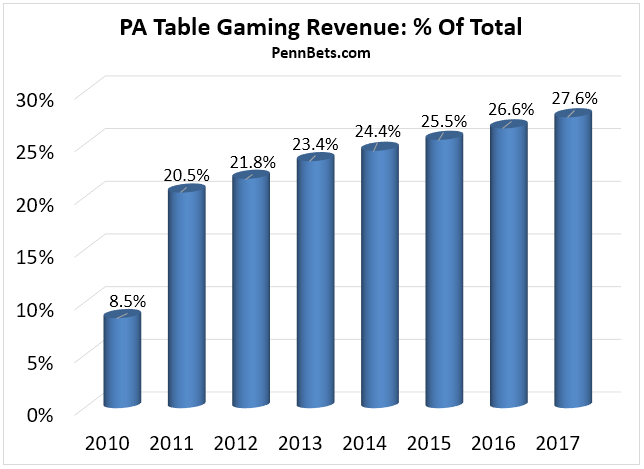 Revenue data released by the Pennsylvania Gaming Control Board shows that the industry has generated more than $3 billion annually every year since 2011. That’s quite the remarkable feat, considering casinos didn’t take their first table games wagers until 2010. On this page, we present the PGCB’s data in an easy to digest format, and provide supplementary commentary focused on short- and long-term market trends. December was a solid month for Pennsylvania’a land-based industry, with year-on-year revenue climbing 2.42% to $263,458,371. In 2017, August and September were the only months that the industry posted larger gains. Unsurprisingly, table gaming continued to gain popularity, with revenue up 5.52% over last December. Slots also booked a win, albeit a smaller one, up 1.22% year-on-year. The industry’s one-armed bandits have turned it around of late, with revenue gains in three of the last four months. Prior to September, y/y slot revenue was down for 11 consecutive months. For the year, PA land-based casinos grossed $3.227 billion, a new record for the industry, and a 0.42% increase over 2016’s then high-water mark. 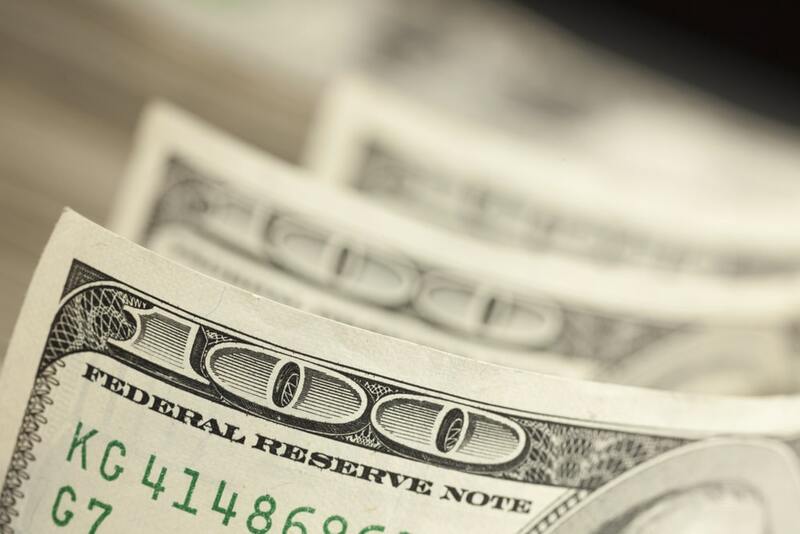 Pennsylvania casinos produced their seventh highest revenue tally of the year in December, compared to last year when December was the industry’s third worst month. Table games accounted for 28.79% of total revenue, which is moderately above the yearly prevalence of 27.6%. 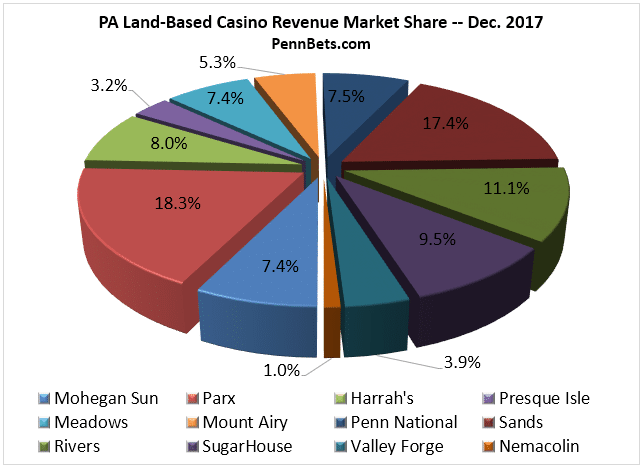 In terms of market share, December was mostly like other months in 2017, with Parx Casino leading the way, followed closely by Sands. Parx generated $48.2 mm last month, good for a 18.3% share of the market, while Sands once again dominated table game revenue (27.8% market share) en route to a 17.4% total market share. The two Rush Street Gaming properties came in third and fourth, with Rivers Casino holding a 11.1% market share, and SugarHouse Casino a 9.5% share. Interestingly, all of the state’s top revenue generating casinos captured more market share in December than they did for 2017. On the flip side, a number of the state’s smaller casinos had below average months. In particular, both Mount Airy and Presque Isle struggled, with the former capturing just a 5.3% share (6.1% annual average), and Presque Isle a 3.2% share off a 3.9% annual average. Harrah’s Philly, Meadows, and Mohegan Sun also saw their market shares dip below their annual average in December. The final numbers are in for 2017, and Pennsylvania casinos have combined to set a new revenue record, but just barely. Revenue was up 0.42% over 2017, and 1.67% over 2015, landing at just under $3.227 billion for the year. Despite the record, this year’s narrative is one of continued stability, with revenue having not varied too much since the first full year table gaming was permitted, 2011. While total industry revenue has been relatively static, table game revenues have not. From 2011-2016, there was only one year when revenue from felt, and now stadium, games has risen less than 5.5%. In 2017, table games registered a more modest 4.0% gain. As of September, we suspected that slot revenue would be significantly lower year-on-year. The past few months of mostly positive gains have resulted in some healing, however, and slot revenue was down just 1.4% for the year. Though less pronounced in 2017, it’s still worth discussing these two multi-year trends — the decline of slot revenue and increase in table game prevalence. 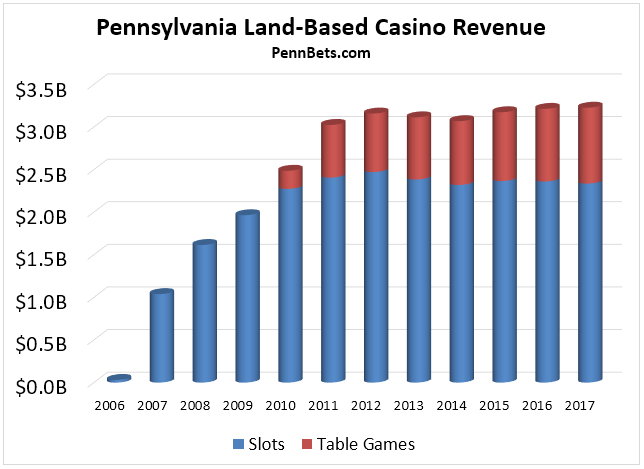 Pennsylvania is subject to an otherworldly 54% tax rate on slots, compared to just 16% on table games, so it’s little wonder why operators are choosing to focus more casino floor real estate and marketing spend to table games. This is no greater evidenced than the recent proliferation of live action terminal table gaming. In August, Sands expanded its stadium style gaming to include a $5 blackjack arena. And just recently, Rivers opened its Rush Table Zone, enabling players to play their favorite table games against a live dealer, but from a computer terminal. We expect table gaming to encompass an even greater percentage of gross gaming revenue in subsequent years. 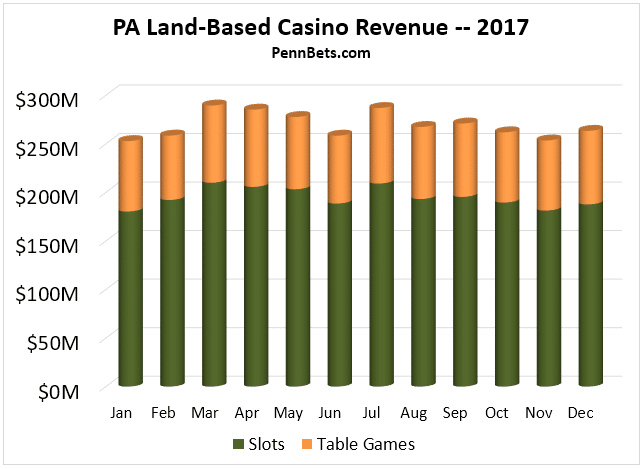 January is generally a poor month for Pennsylvania casinos, with month-over-month revenue dipping 5.1% in January 2016, and 1.7% last year. There’s little reason to suspect this January will be any different, as it has just eight weekend days. A strict comparison to last January might provide a sunnier picture, as recent trends suggest there’s a good chance both slots and table games will register year-over-year gains. Looking ahead, it might not be too long before PA receives a serious revenue infusion, thanks to the imminent launch of up to 10 satellite casinos in the state. While these smaller casinos (capped at 750 slot machines and 30 table games) could cannibalize some existing traffic, the threat is minimal, as by law they must be located at least 25 miles from an existing venue. As such, population centers where casino gaming is currently unavailable could suddenly see a lot of gambling activity. In early January, Penn National won the first satellite casino auction, paying a staggering $50.1 million for a license. 2018 should also see the first online casino and poker sites launch. Online gambling has proven a boon in New Jersey, both in its own right and as a driver of brick & mortar traffic. In some ways, Pennsylvania is even better positioned than New Jersey was at launch to support a successful industry, but the oppressive 54% tax rate on slots and the high licensing fees could prove very damaging.